1. In large skillet or roasting pan, melt 2 tablespoons butter over medium-high heat. Add apples and cook 5 minutes or until lightly browned, stirring occasionally. Remove apples from skillet with slotted spoon. 2. In large bowl, toss chicken with flour, 1/2 teaspoon salt, 1/4 teaspoon black pepper and cayenne pepper until well coated. Add remaining 2 tablespoons butter and chicken to skillet. Cook over medium-high heat 5 to 6 minutes or until chicken is browned and almost cooked through, turning occasionally. Remove chicken from skillet; keep warm. 3. Add celery, shallot and bell pepper, and cook 3 to 4 minutes or until shallot is golden brown, stirring occasionally. Add brandy to deglaze skillet. With wooden spoon, scrape brown bits from bottom of skillet and cook 2 minutes. Add apple juice and cream. Heat to simmering and cook 10 minutes. 4. Return chicken to skillet and cook 1 minute. 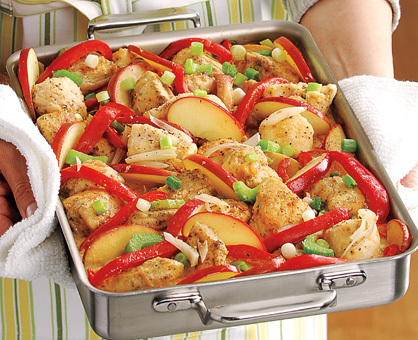 Return apples to skillet and cook 1 minute or until chicken is cooked through. Remove skillet from heat. Stir in lemon juice and remaining 1/2 teaspoon salt and 1/2 teaspoon black pepper. Serve garnished with green onions.